For those of you who have never picked and eaten a fresh berry, I recommend adding this to your lifetime “bucket list.” There is nothing like freshly picked berries. And, as a bonus, when you pick them yourself you get the really ripe, sweet ones that are too delicate to make it to the grocery store or even a farmers market. This week Dave discovered the huge patch of bushes in the backyard of our new rental house is filled with red raspberries. Cursory glances back at this area of the yard this spring led us to think they were blackberry bushes – considered a nuisance here in Washington since they grow wild all over the state. To our delight we now have a private stash of the most incredible red berries and have been plucking the choicest ripe ones from the backyard for breakfast and dessert all week! We usually venture out to breakfast one morning of the weekend – kind of a leisurely way to start the day. 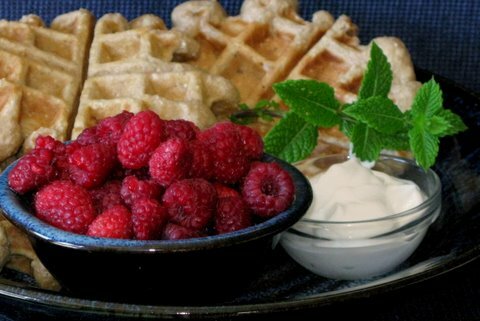 This morning we decided to stay home and make a breakfast to feature our fresh raspberries. We have both shied away from pancake and waffle type breakfasts for a while, since they just don’t seem to stick with us, especially if we are doing something active for the day. Then, while we were in Burlington, Vermont recently Dave had some really hearty, tasty oatmeal pancakes at this fantastic restaurant that was a member of the Vermont Fresh Network (an organization that links farmers, chefs and eaters so the restaurants feature a variety of locally sourced, delicious whole foods). The pancakes were not only outstanding but held up during our very busy day. So, this morning I decided to play with a waffle recipe and used quick oats, whole wheat pastry flour, unbleached white flour and walnuts to make them hearty. I used buttermilk and cinnamon for additional flavor too. All I can say is WOW. Topped with the fresh raspberries, Greek-style yogurt and real maple syrup these were by far the best waffles I’ve ever made. I kept thinking anyone who thinks healthy food doesn’t taste good isn’t doing it right. For the record, raspberries are a nutritional powerhouse. With only 60 calories in a cup and 8 grams of fiber they are filling and one of the best calorie bargains in the fruit world! In addition to lots of vitamin C, some B vitamins and important minerals, raspberries boast quite a complement of phytonutrients including powerful antioxidants and other compounds with anti-cancer properties. The good news is that although the vitamin C, riboflavin and folate may be reduced with freezing your extra fresh berries, the plethora of special plant compounds are not affected by freezing. Above is the photo Dave took (adding a sprig of fresh mint) before we headed to the back deck to enjoy our incredible morning feast. Here is my recipe for any of you who want to try a hearty waffle recipe (that I suspect can be easily altered to make pancakes as well). For those of you with blood sugar issues who have sworn off pancakes and waffles to start your day, and miss them – these are worth a try. Mix dry ingredients in medium size bowl and wet ingredients plus the sugar in a small bowl. Add the wet to the dry mixture and mix until just combined – try not to over mix. These are very hearty so you may want to make the waffles smaller than usual. Leftover waffles make great lunch or snack spread with almond or peanut butter and a drizzle of honey. You can add 1 tablespoon of vinegar to one cup of any kind of milk if you don’t have buttermilk then just use an additional ½ cup of water. I bought a half pint of buttermilk and added the ½ cup water. If you don’t have quick cooking oats you can quickly pulse rolled oats in a food processor, blender or coffee grinder. I used some unbleached white flour to make sure the waffles weren’t too dense however, if you prefer dense and hearty baked goods you could easily just use whole wheat pastry flour and oats and skip the white flour.